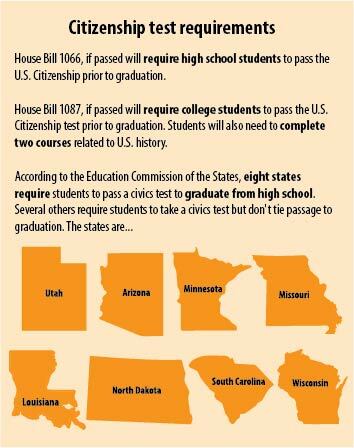 The South Dakota House of Representatives currently has two bills in discussion that would require both high school and college students to take the United States Citizenship test prior to graduation. House Bill 1066 will require high school students to pass the civics test, while HB 1087 will not only require college students to pass the test but also complete six more credit hours of United States history courses. Currently, students are not required to take any history course in order to graduate from a South Dakota Board of Regents University. History classes can be taken in order to fill certain general education requirements, however. David Burrow, chair of the history department, said if HB 1087 does pass, the Board of Regents will have to figure out how they fit the new required courses into all university and student requirements. If passed, students will have to complete the civics test with a score of 80 percent or higher. They will, however, be allowed to take the test as many times as they need in order to earn this score. Burrow said one of the concerns with this bill is the lack of clarification on how the test will be administered. Elizabeth Duncan, a first-year medical biology major, said she doesn’t see this bill passing because of complications with the required courses. Katrina Callahan, a junior political science major, said she likes the idea of students taking more history classes. “I like the idea of it. I think that not enough kids know about how the government works and the history of the U.S., and I like the idea of the civics test because I think if we expect people coming into our country to pass the test, I think we should have to pass the test,” Callahan said. Burrow said passing the civics test is not the challenge, the challenge will be figuring out the logistical aspect of the bill.